Cevher Meerschaum | Old Morris Tobacconist Victoria BC, Fine Cigars, Humidores and Tobacco Merchantile. Meerschaum, or sepiolite, is a soft white mineral used in the construction of smoking pipes. Its name comes from the German word for sea foam, and is often found floating on the Black Sea. Meerschaum pipes have been smoked since the early 18th century, and gradually change colour from white to shades of amber as the pipes age. Meerschaum enthusiasts argue that the mineral's porous and sweet smoking qualities make it the optimal pipe material. 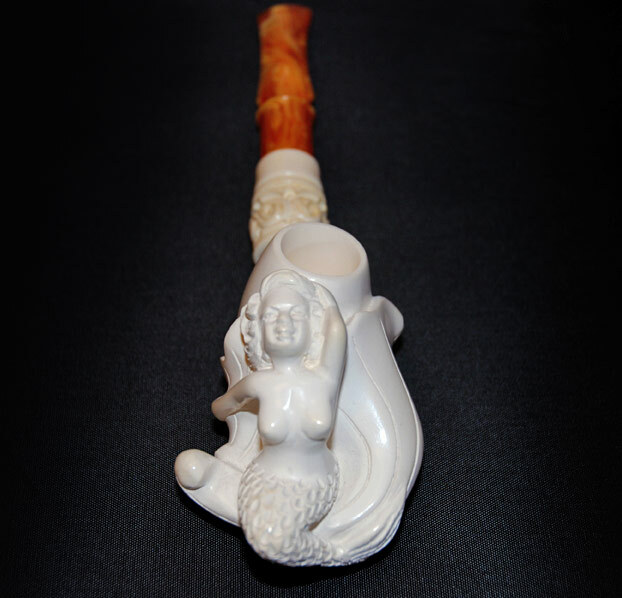 This Meerschaum pipe, made by Cevher, is a unique, hand-carved collector's piece. It shows a mermaid reclining against the bowl, her left arm resting behind her head. It has a silver band and delicate scrolling artwork.